Bible study isn’t about how long you study each day. It doesn’t matter if you use world-renowned resources or read top-selling Biblical writers. It isn’t an item to check off on your to-do list. Also, it isn’t helpful if you study the original languages and you aren’t getting closer to God. It’s about cultivating a relationship…a relationship with God, the Creator of Everything. In the coming weeks, I’ll share ideas that can jumpstart your Bible study. You won’t use each of the ideas. But making even one or two changes will affect the way you approach and feel about your quiet time. It will also help you enjoy the process of knowing God better. Read on and let yourself be motivated by one of the below ideas. 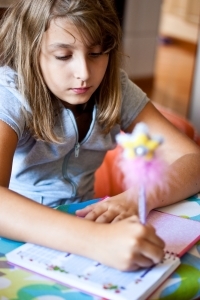 CD – Auditory learners will thrive on this type of study. I listen to teaching CD’s when I am in the car or when my eyes are too tired from extended computer use. I’ve listened to books (5 Love Languages of Children) and sermons from current teacher/ preachers (Joyce Meyer and Charles Swindoll) , my pastor (Mike Mitchum) and those long dead (CH Spurgeon). Children’s curriculum – I often go this route when I am learning anything new. The study sticks to the main points, is short, and is visually pleasing. Your local Bible bookstore will have many options. I recently picked one up on Missions. Go the extra mile and then teach the study to a child (yours or a borrowed one). Books – Many Christian books have a study guide at the back of the book or at the end of each chapter. You can go through it on your own or with others. It’s nice that you don’t have to pay extra money for these questions. Some example of books that include questions . . . The Five Love Languages for Singles, Facing Your Giants, and Power of Prayer. DVD – If you are a visual learner this is a great choice. The topics are many and the study is usually well done. Get a DVD study and invite neighbors or friends to join you. Typically DVD studies are more costly. If cost is an issue check what’s available at your local library or church. Over the past year I’ve gone through Boundaries and The Power of a Praying Woman. Topical studies – The choices here are numerous. Some have few chapters and some many. Some are in-depth and some give an over view. I’ve gone through Lessons on Christian Living with several ladies and it always impacts them and me. I’ve gone through The Treasure Principle twice. Grieving God’s Way is one I hope to lead in the fall . Magazines – Use a magazine as a jumping off point for study in the Bible. Magazines cover a range of topics and purposes. These include . . . Teach (Biblical Archeological Review, Leadership Journal ). Lastly some give info related to certain . . . Professions (Journal of Christian Nursing, Christian Business Daily). Lastly, try incorporating devotionals into your Bible study time. 7. Devotionals – These are typically a few pages long, expound on one passage (point or person), clearly define the main point and end with an application. Though this type of study requires few minutes, the depth of the material is apparent and the impact it has is real. I’ve read many types of devotionals. Some . . .
Give daily snippets about a topic I want to know more about (50 Days of Heaven: Reflections That Bring Eternity to Light). Bring family members closer: Each Christmas a friend buys multiple copies of the same devotional. She keeps one and gives the others to her family members. Sometimes they share their thoughts in-person, through email and on the phone. They use the devotional as a springboard for praying for one another. Reading the devo increases their intimacy with God, and reading the same thing each day as a group increases the feeling of community. Stay Tuned for Idea 2 on Revving Up Your Bible Study: Small Groups. Have you even been bored with your Bible study time? What do you think it means if you are bored? What resources would you recommend from the above categories? What would you add? Please leave a comment if you try one of these ideas. Looking for a small group where you can connect and learn with other women? 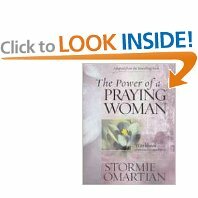 Sunday (January 10, 2010) we will be starting The Power of a Praying Women by Stormie Omartian, 11 am at CNC. The room is TBD. This 10 week class will guide women through the basics of prayer via video, discussion, daily homework, and of course prayer. The workbook is $10.17 from Amazon (normally $14.95). Let me know by (January 6) and I will order a book for you. Make the check out to CNC and put “women’s Sunday study” in the memo line. The video curriculum workbook will be a valuable resource for learning about the topic before the class because each week has five day’s worth of interaction with that week’s message, Scripture and prayer. The first five lessons will cover the following: Praying to become all God made me to be . . . Praying for a life-transforming walk with God. . . Praying to be free of the past . . Praying to put my life in right order . . . Praying to surrender control of my life to God. However, it is not necessary to have the workbook in order to attend the class or gain from the information presented. Just be sure to bring paper if you are a note-taker. 8 women have already signed up for this 10 week class. Please join us as we learn more about prayer and practice what we learn as a group and on our own. If you’ve already done this video study or read the book, what is the gem that you still remember? Still practice? What would you like to learn about regarding prayer? Looking for a good commentary on Genesis? Our pastor recommends this one by Derek Kidner. Pastor Mike said its the kind of book where every sentence is loaded. You can get a commentary for as low as $1.48 + $3.99 shipping. Yes, of course I ordered one! If you order one too, let me know. Maybe we can talk about what we read. Conflict is the Answer. What’s the Solution? Question: What one thing is experienced by 100% of all people? Conflict is something that everyone has in common. We all get stressed from it. We all, at times, handle it badly. Sometimes we are the receivers. Sometimes we are the initiators. What can we do about the conflicts we all experience? Pastor Mike has an answer. Starting September 23rd he is guiding the church through a new series on peacemaking. This eight week series will present the tools needed to handle conflict in a way that is satisfying, helpful and biblical. Small Groups will also be going through the same information. That way we can practice using these tools. “We grow through copying deeds, not just listening to words, through examples as well as precept, through habit and not just insight and information” (Os Guinness). Watch the bulletin for details on the small groups. Sign up in the foyer. Contact me if you are interested in becoming a small group leader. Spending time with Nasim, a 20 year old woman who is desparate to improve her English. She struggles with self-doubt regarding her scholastic future. Nasim wanted extra help so I asked her (yesterday) to write an essay about one of her dreams and how to accomplish it. It is evident that she worked hard on it. It is also evident that she’ll become fluent in englsih (which she speaks with an english accent). My hope and prayer is that I’ll be able to pass along some encouragment to Nasim. Nezam brought the hummous, etc. Very tastey. And more importantly we are buidling a freindship bridge. Nezam is a gentle, caring woman who wants to make us feel welcome here. We do! I was able to spend a few minutes praying with two Believers. I prayed in English and they prayed in Arabic. I’ll get to see both of them at church on Sunday. I am anxious to hear how God answered our prayers of supplication. Shula and I were invited to visit Awatif. Hopefully we will be able to schedule a time for next week. Jessica and I had a long talk about this land, the work going on here and politics. She is such an informed, but gentle speaker, it was a joy to listen, learn and “debate” with her. I feel so privileged to be able to be here teaching english, listening and learning. Thank you for your prayers. I still make cultural mistakes, but so far nothing too drastic. Hey, Wanna Join My Hunt? I’m going on a Mark hunt. I’m on Step one.